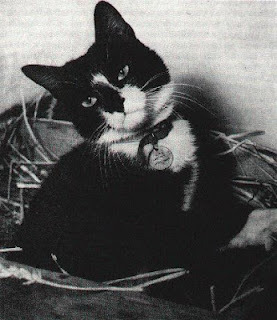 On this Veteran's Day, petMD, a leading online resource focused on the health of pets, pays tribute to four cats who served their countries during war time. Crimean Tom: During the Crimean War when the French and British armies seized a Russian port in 1854, Tom the cat helped the troops locate a much needed stockpile of food that the Russians had hidden. He was considered a hero and the English brought him home after the war. Tiddles: Was the Captain's cat on the HMS Victorious. He spent his entire life on board Royal Navy aircraft carriers. petMD reports that "he is one of the reasons the black cat is considered good luck in Great Britain." Able Seacat Simon worked as a ratter on the Royal Navy's HMS Amethyst. He was badly wounded when Chinese communists fired at the ship on the Yangtze River, but he survived and went back to his duties. He received two awards for his service including the Dicken Medal for bravery. He is the only cat to have received this medal. He was buried with full naval honors. Pfc. Hammer: Served in a unit with the US Army in Iraq as a mouser and companion to the troops. The Egyptian Mau cat was made an honorary member of the unit. For his service and dedication, the troops arranged to have Hammer brought home after their deployment. The cat is now living in Colorado with the staff sergeant who worked to bring him to the states. Very cool. We are glad PetMD did this to honor our animal veterans. Those 4 are heros and smile bringers! Great tribute to the holiday and kitties! Thanks for the visit and the kind comment on my blog. It's lovely to have found your blog, you write about interesting kitty topics! I now follow, so keep the good stuff coming! Awwwww yay for these brave beautiful kitties!! There is a really lovely poignant memorial for all animals who lost their lives helping out during the wars here in London - such amazing stories! Oh this is great! I didn't know about Pfc. Hammer. It's great to see hero kitties being recognized. Thanks for sharing! Thanks for this post! Me too blogged about war animals on Rememberance Day. This s a post me shall bookmark! What a great post to honor and remember kitties who served for their countries! I did not know about them. Thank you for sharing their stories with us. What a cool post! Loved it Ann, thanks so much.